This is a good example of why you should search for news articles about your ancestors in states other than just their home state! There are countless other sources (land transactions, stories, Census records, etc.) on Ancestry.com about Rev. Thomas Hiscox and his father. The following are some publications I found that list people who chose the clergy life. Some of these publications are out of copyright and therefore free on the Internet. 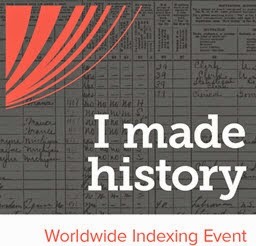 If you don’t see a link under a book that you want to order, try locating it on WorldCat.org, Amazon.com, FamilySearch.org , Ebay.com or Genealogical.com. Glatfelter, Charles Henry. Pastors and People: German Lutheran and Reformed Churches in the Pennsylvania Field, 1717-1793. Pennsylvania German Society: Breinigsville, Pennsylvania, 1981. Goodwin, Edward Lewis. The Colonial Church in Virginia: With Biographical Sketches of the First Six Bishops of the Diocese of Virginia, and Other Historical Papers, Together with Brief Biographical Sketches of the Colonial Clergy of Virginia. Milwaukee, Wisconsin: Morehouse, 1927. Kanely, Edna A. Directory of Ministers and the Maryland Churches They Served, 1634-1990. Westminster, Maryland: Willow Bend Books, 1991. Simpson, William Samuel. Virginia Baptist Ministers, 1760-1790: A Biographical Survey. Richard, Virginia: W.S. Simpson, Jr., 1990. Taylor, James Barnett. Virginia Baptist Ministers, 1804-1871. Philadelphia, Pennsylvania: J. B. Lippincot, 1859. Weis, Frederick Lewis. The Colonial Clergy of Maryland, Delaware, and Georgia . Baltimore, Maryland: Genealogical Publishing Company, 1978. Weis, Frederick Lewis. The Colonial Clergy of the Middle Colonies: New York New Jersey and Pennsylvania 1628-1776. Baltimore, Maryland: Genealogical Publishing Company, 1978. Weis, Frederick Lewis. The Colonial Clergy of Virginia, North Carolina, and South Carolina. Baltimore, Maryland: Genealogical Publishing Company, 2005. Dover Publications, Inc., Mineola, New York, Electronic Clip Art, Christian Symbols, 2003. (1) The Colonial Clergy and the Colonial Churches of New England by Frederick Lewis Weis, Reprinted for Clearfield Company by Genealogical Publishing Company, Baltimore, Maryland, 1936. (2) GenealogyBank, Saturday, June 5, 1773, Paper: Providence Gazette (Providence, RI), Volume: X Issue: 491, Page: 3, NewsBank and/or the American Antiquarian Society. 2004. (http://www.genealogybank.com: accessed December 16, 2012). (3) GenealogyBank.com, Monday, May 31, 1773, Paper: Newport Mercury (Newport, RI) Issue: 76, NewsBank and/or the American Antiquarian Society. 2004. (http://www.genealogybank.com: accessed December 16, 2012). (4) GenealogyBank.com, Sunday, July 19, 1931, Paper: Boston Herald (Boston, MA), Page: 61 NewsBank and/or the American Antiquarian Society. 2004. (http://www.genealogybank.com: accessed December 16, 2012). (5) Ancestry.com. The first hundred years : Pawcatuck Seventh Day Baptist Church, Westerly, Rhode Island, 1840-1940. [database on-line]. Provo, UT: The Generations Network, Inc., 2005. Original data: The first hundred years : Pawcatuck Seventh Day Baptist Church, Westerly, Rhode Island, 1840-1940.. Westerly, R.I.: The Utter Co., 1940. (http://search.ancestry.com/browse/bookview.aspx?dbid=16508&iid=dvm_LocHist004272-00144-1&rc=806,2877,1158,2933;1155,2878,1444,2939;266,2997,580,3061;578,3004,849,3065;300,3334,560,3396&pid=244&ssrc=&fn=william&ln=hiscox&st=g: accessed December 16, 2012). (6) Record for Thomas Hiscox, Source number: 19953.000; Source type: Electronic Database; Number of Pages: 1; Submitter Code: BFO. (7) Dedication of Minister's Monument, Aug. 28, 1899, Author: First Hopkinton Cemetery Association (R.I., First Hopkinton Cemetery Association, Mary Bassett Clarke, First Hopkinton Cemetery Association (R.I.), Publisher: printed for the Association by the American Sabbath Tract Society, 1899 (http://archive.org/details/dedicationminis00unkngoog: accessed December 16, 2012). (8) Westerly (Rhode Island) and Its Witnesses: For Two Hundred and Fifty Years, 1626-1876 by Frederic Denison, Publisher: J.A. & R.A. Reid, 1878, CD-ROM, p. 62. (9) Find A Grave, Inc., Find A Grave, digital image (http://www.findagrave.com : accessed December 17, 2012), “memorial for Rev. Thomas Hiscox (1686-1773), Memorial No. 29211911, created by Superkentman, photograph added by Jane Ferner Lawrence.